What's in a modern bathroom? Well, actually, the question should be: what's not in a modern bathroom? If you're planning on gutting your bathroom entirely for a modern look, you need to understand that simplicity truly is key. A modern bathroom differentiates from a traditional one in many ways. However, perhaps the main detail that characterizes a modern space is its sheer minimalism. In these rooms, don't expect to find any ostentatious design elements, like carved detailing in wood furniture. Instead, clean lines and streamlined pieces are used. Additionally, the colors are particularly toned down in a modern setting, unless you want to make a statement with a bold piece of furniture. Transforming an outdated space into a modern one is fairly simple - just restrict yourself from using too many bathroom accessories and cluttering the area. 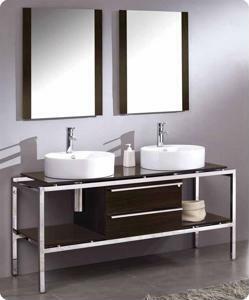 For that quintessential modern piece, choose a bathroom vanity in a neutral tone with linear design and chrome detailing. Pick up the metal with chrome faucets and fixtures that will complement the overall aesthetic of the room. Do you really need a bidet in your bathroom? Should you DIY a toilet installation?